“Early Mass,” by Benita (McGinnis) McCormick. Pen and ink over watercolor on parchment. Sometimes you just have to take some time off to make memories, not only remember them. And that’s why it’s been a bit quiet lately here at Many Branches, One Tree. Priorities of family have been the order of the day. I must admit it’s been rather nice to pull off the Internet Highway for a while to be fully present to and enjoy the ones I love. But I can’t be away forever. Here’s my gift to all of you, courtesy of my beloved “Aunt Detty,” who created this lovely scene, titled Early Mass, one snowy Milwaukee night some 91 years ago. 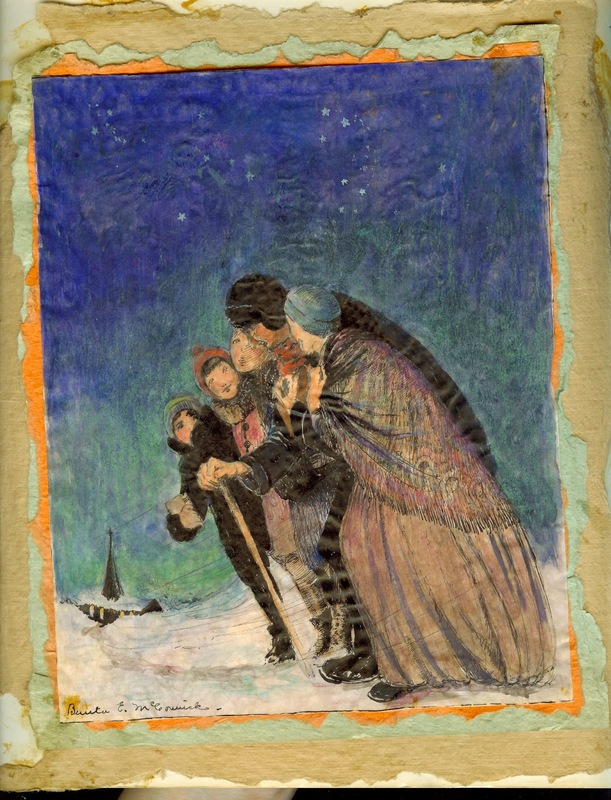 Depicting a family making their way through the bitter cold to the church in the distance, it evokes the deep love, faith, and devotion of that holiest of families, Joseph, Mary, and Jesus, whose feast day the church celebrates today. Wherever you are in the world as you read this, whether in the chilly north, on a sunny beach, or somewhere in between, may you and your loved ones enjoy all the blessings of this sacred Christmas season – and may the New Year bring you many occasions to create special memories together.